Guy Ritchie’s latest film is a most satisfying thrill ride, bringing espionage, secret agents and world history together while updating a classic 1960s TV series. Loved it totally. It’s the prequel that was always meant to be. Can’t say enough great things about it. Little but important details give this movie authenticity and believability. How long, for example, did Armie Hammer practice that Russian accent for his role – it was veritably perfect. (And Hammer, whose famous paternal great-grandparents were Russian-born, was perfectly cast as Illya Kuryakin.) 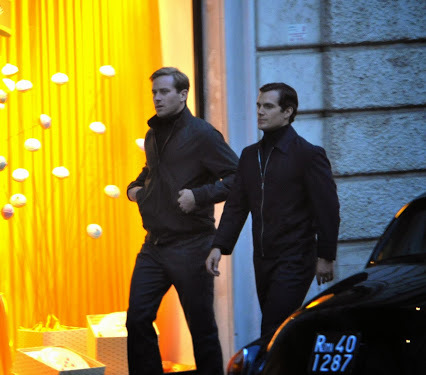 Laurence Olivier lookalike, Henry Cavill, as Napoleon Solo in some scenes nailed Robert Vaughn’s voice. Alicia Vikander as the striking fashion plate (and car mechanic) Gabby Teller often lightened up the sharp-angled espionage with humorous edges, as well as surprisingly being a love interest to Kuryakin, not Solo. Hugh Grant was an appropriately distinguished Waverly. I did somewhat miss the original U.N.C.L.E. theme music – and there was no classic “Open channel D” quip – both of which may well show up, likely updated, in the sequel(s). The tech stuff wasn’t quite there yet in the storyline. This deserves at least one sequel, maybe two or three. In this first movie, U.N.C.L.E. was born from a union of CIA and KGB, and the bond of trust and friendship between agents Solo and Kuryakin was forged. Can hardly wait for the next installment.